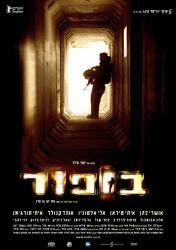 Action/Drama/Gainful, Israel, 2007, 125 min. Tagline The story of a group of Israeli soldiers stationed in an outpost prior to the withdrawal of forces of 2000. Based on the novel by Ron Leshen. Synopsis BEAUFORT tells the story of LIRAZ LIBERTI, the 22 year-old outpost commander, and his troops in the months before Israel pulled out of Lebanon. This is not a story of war, but of retreat. This is a story with no enemy, only an amorphous entity that drops bombs from the skies while terrified young soldiers must find a way to carry out their mission until their very last minutes on that mountaintop. As LIRAZ lays the explosives which would destroy that very same structure that his friends had died defending, he witnesses the collapse of all he's been taught as an officer, and his soldier's mental and physical disintegration.